We can always rely on Rally Argentina to create a thrilling finale and this year’s event certainly did not disappoint! In scenes reminiscent of last season’s event when Hayden and John claimed a stunning victory, the outcome of this year’s rally went right down to the Power Stage. Our Belgians Thierry and Nicolas had been gaining on rally leader Elfyn Evans since Saturday morning. They moved to within 0.6-seconds after a sensational drive through Mina Clavero – Giulio Cesare, the penultimate stage of the rally. The scene was set for the ultimate showdown. Two crews went head-to-head for glory in the El Condor Power Stage – and it was our #5 crew who came out on top by a fraction. Just 0.7 seconds split the top two. It was the third closest finish to the WRC event in history! 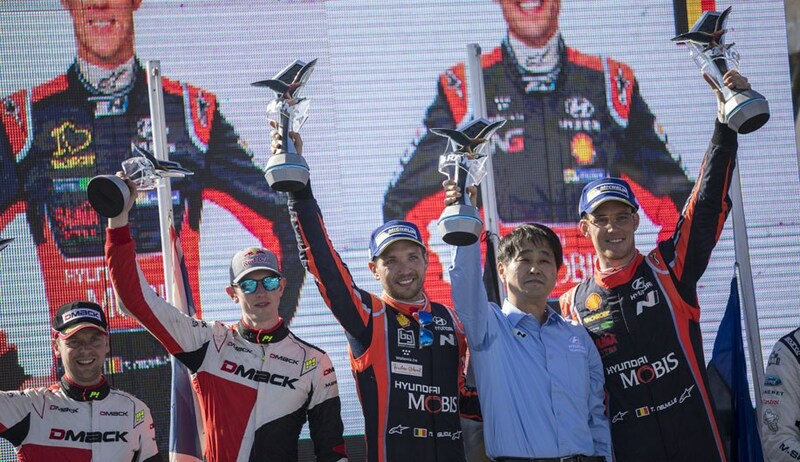 The win marked our fifth ever in WRC and our second in a row, the first time we’ve achieved that feat. We’ve also become the first team to score repeat wins in 2017. A bumper haul of points means we’ve strengthened our grip on second in the Manufacturers’ Championship. It was a less positive end to the rally for Hayden and John, who experienced power steering issues in the final stage. Despite picking up their first stage wins of the year earlier in the weekend, their Rally Argentina came to a tough conclusion in sixth place. Dani and Marc also limped home after picking up a puncture while on fast pace in the Power Stage. It was a rally to forget for our Spaniards.